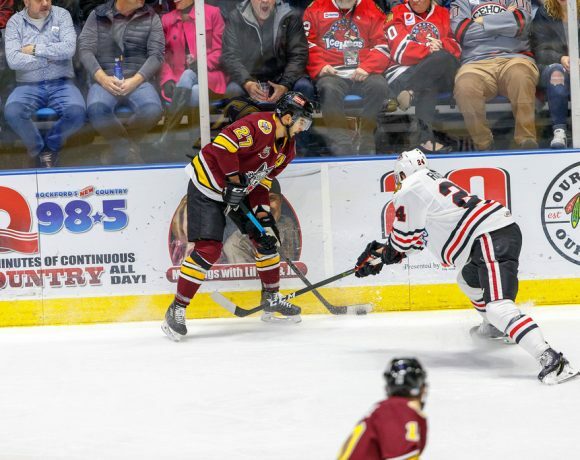 The Rockford IceHogs saw a losing streak swell to four games before knocking off the Chicago Wolves in Rosemont Saturday night. The piglets are mired in a pretty rough patch since the holidays. Rockford is 2-8-1-1 since December 26. This stretch has resulted in the Hogs dropping to last place in the AHL’s Central Division with a .488 points percentage. The fortunes of AHL teams can change quickly as rosters fluctuate. That said, the gap between the division’s playoff teams and the IceHogs is growing. Fourth-place Texas has a five-game points lead over the Hogs with three games in hand. Last year’s club was in better position (22-16-5, .534 points percentage) than the 17-18-3-5 IceHogs are after 43 games this season. The key push started in February when the organization picked up veteran reinforcements. This begs a pair of questions. Will the Blackhawks be able to bolster the AHL roster in the coming weeks? More importantly, will reinforcements make a difference? 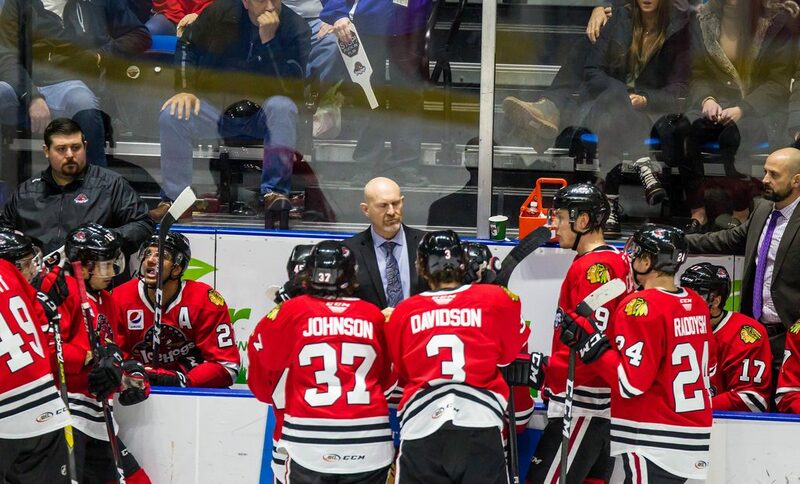 Two seasons ago, the IceHogs suffered through their worst finish in franchise history, finishing dead last in the Central Division and winning just 25 games. The offense, which also marked a franchise nadir, was last in the AHL at 2.30 goals per game. Through 43 games in 2018-19, Rockford is scoring at a 2.26 goals per game clip. It should come as no surprise that the Hogs are still last in scoring among the 31 AHL clubs. Rockford is the only team in the AHL that has not eclipsed the 100-goal mark. Viktor Ejdsell was back in action last week after missing almost a month to injury. The big Swede made his return January 11 in Texas. He didn’t get on the scoresheet that night. However, Ejdsell has posted points in each of his last five games. Ejdsell scored the Hogs only goal Tuesday night. He sent a shot off the pads of Harri Sateri Friday to set up William Pelletier’s goal, then cleaned up a rebound of Lucas Carlsson’s attempt to get Rockford on the board in Saturday’s overtime win. With Rockford hurting for offense, Ejdsell coming back is a positive. If he can get on a roll, maybe a few other players can find the scoring touch. Defenseman Neil Manning, who was on an AHL contract with the IceHogs, was released from his contract on Monday. Manning, who had appeared in three games with Rockford, was named to the ECHL’s Western Conference All-Star Team. By mutual agreement, Manning was released so that he could pursue work overseas. He quickly signed with the EC Kassel Huskies in Germany. Matheson Iacopelli was recalled to Rockford on Thursday. It’s been a tough year for Iacopelli, who has been in an out of the lineup with the IceHogs. He has two goals and two assists in 26 games this season. Following Friday’s game, Hogs coach Derek King revealed that F Tyler Sikura, last season’s team MVP and second-leading goal scorer, had suffered a broken thumb in practice. Rockford will miss his high compete level for however long he is out of action. It was yet another one-goal loss for the IceHogs this season. This one was the third straight loss on the Texas road trip. Rockford got the game’s first goal 14:08 of the opening period. William Pelletier brought the puck from behind the Rampage net and sent a pass out to Blake Hillman just inside the San Antonio blueline. Hillman swiftly sent the biscuit to Viktor Ejdsell at the right circle. The shot beat Rampage goalie Jared Coreau to the stick side and put the IceHogs up 1-0. It would remain that way into the first intermission. The Rampage tied the game midway through the second period on a goal by Mitch Reinke. The shot got past Rockford goalie Anton Forsberg, who was fighting a lot of traffic in front of his crease. The game remained even until late in the final frame. A Luke Johnson turnover was snatched up by San Antonio’s Trevor Smith. Smith sent the puck into the slot, where Bobby MacIntyre slapped it past Forsberg and into the back of the net. With 3:19 to play, the Rampage went up 2-1. The Hogs pulled their goalie with 2:20 left but was unable to secure the equalizer. Rockford returned to the friendly confines of the BMO Harris Bank Center Friday, dropping its fourth-straight game. The IceHogs got on the board late in the opening frame. Dennis Gilbert brought the puck into the Griffins zone, came around the net and hit Viktor Ejdsell at the right dot. Ejdsell stickhandled into a shooting position and sent an offering off the right pad of Grand Rapids goalie Harri Sateri. The rebound found the stick of William Pelletier, who buried it into the twine at 17:38 for a 1-0 Hogs lead. Grand Rapids tied the game two minutes into the second after Wade Megan scored a clean faceoff win. The puck came out to Jake Chelios, who sent the puck high on Lankinen. The shot, which may or may not have glanced off of the stick of Nick Moutrey, fluttered into the Hogs net to knot the contest at a goal apiece. Midway through the final frame, Megan put Grand Rapids up 2-1, taking a pass from Matt Puempel at the right dot and roofing the shot past Lankinen. That was enough to beat the Hogs, though Megan added an empty-netter to put a bow on this one. The Wolves erased a two-goal Rockford advantage early in the third period. However, the Hogs persevered to claim the win in Gus Macker Time. Neither team found the back of a net in the opening twenty. Rockford got the game’s first goal from the stick of Viktor Ejdsell, who followed up on a shot by Lucas Carlsson. Carlsson had gotten the scoring play started after gaining possession in his own zone. Working with Graham Knott, the two made their way to the Chicago net, where Oscar Dansk made the initial stop before Ejdsell took care of the rebound at 2:37. A few minutes later, Andrew Campbell took a pass from Andreas Martinsen at the top of the left circle and sent a shot above Dansk’s glove. 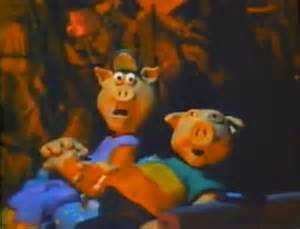 The IceHogs now had a 2-0 lead at the 6:51 mark of the middle frame. That cushion was gone early in the third period following penalties by Dennis Gilbert and Luke Johnson. Dylan Coughlin scored on the resulting 5-on-3 at 2:32 of the third. While still up a skater, Erik Brannstrom tied the game at the 3:18 mark. The Wolves out shot Rockford 12-3 in the final period of regulation; the IceHogs failed to log a shot on goal until the final minutes. Anton Forsberg kept the Wolves at bay for the remainder of the third period. In all, the Hogs goalie stopped 36 shots on the evening. Forsberg’s efforts were not in vain. Rockford broke the tie 1:29 into the extra session, when Knott knocked a loose puck in at the right post. High On The Hog: Here Come The Bears?